The full fury of Hurricane Sandy was bearing down on the New Jersey National Guard armory in Teaneck just after 4 a.m. on Oct. 30, when the call came in. 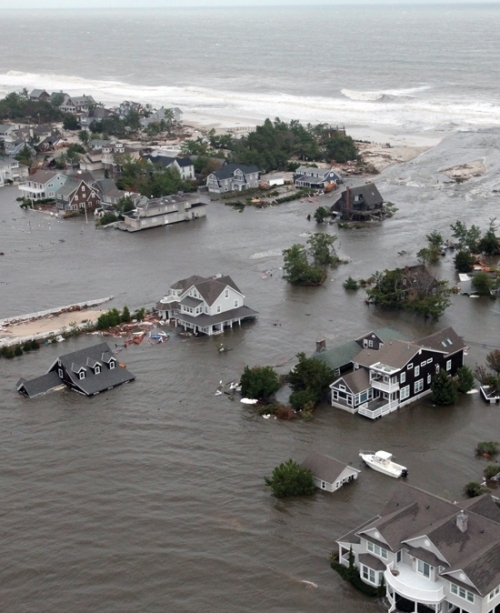 A levee had burst 10 miles away, sending a torrent from the Hackensack River into the towns of Moonachie and Little Ferry. Lives were in danger. "People just wanted help to get out of those places, they were fi lling with water. We were helping older people, women with children, dogs, cats, anything we could fi t on the trucks." "There were people trapped who were being forced to the roof of their homes because of rising waters. Without that five ton, without the National Guard and the fire department working as a team, we would have not gotten to those people." On a sunny day in June, Joint Force Headquarters (JFHQ), located at Joint Base McGuire-Dix-Lakehurst, N.J., saw the end to one Airman's career and the beginning of another. Command Chief Master Sgt. 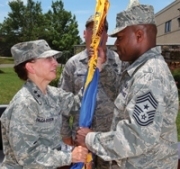 Vincent Morton, until recently the 108th Wing command chief master sergeant, assumed responsibility as the state command chief from outgoing Command Chief Master Sgt. Michael Francis during a Change of Authority ceremony at JFHQ June 9, 2012. Preparing and going through all those inspections was stressful for the 177th Fighter Wing, but when it came time to deploy to Bagram Air Field in Afghanistan in December 2011 all that preparation really paid off. "Having been through a UCI (unit compliance inspection), a Phase I and Phase II ORI (operational readiness inspection), we fit the Air Force mold perfectly," said Lt. Col. Bradford R. Everman, deputy commander, 177th Maintenance group. "Our preparation for those inspections ensured we were on our game." Although just 29 years old when he died in an aircraft mishap, 1st Lt. Thomas E. Williams had secured a place in history by helping usher in the civil rights movement. Following his graduation from West Philadelphia High School in 1942, Williams enlisted in the United States Army Air Force and entered into the Army Air Force Pilot Training Program at the Tuskegee Army Airfield, Ala.